Worked perfectly on my 95 Honda Accord with factory power antenna. Existing cable had broken during radio replacement and needed this to connect the new radio to the antenna. 13.1' Antenna Signal Extension Cable: The antenna cable has a high density braided shielding, and is terminated with a standard sized male Motorola plug on one end and a standard sized female Motorola plug on the other. It includes an impedance matching capacitor. 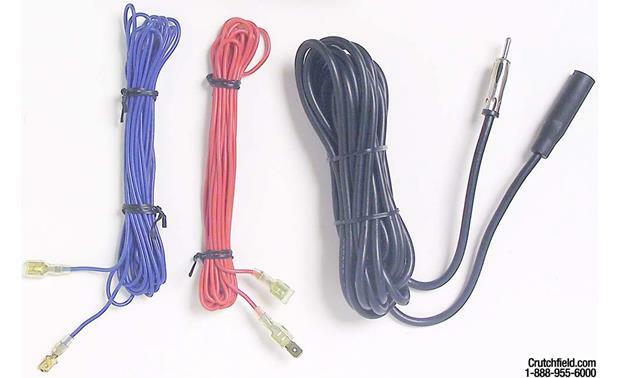 13.1' Power Wire (Red): The red wire comes with a 1/4" female slide connector on one end, and the other end is terminated with a 1/4" female/male slide connector. (This connector may be used as a male or female connector; the male tip may be broken off for applications requiring a female connector). 13.1' Turn-on Wire (Blue): The blue wire comes with a 1/4" female slide connector on one end, and the other end is terminated with a 1/4" male slide connector. Note: To use the extension wires with the attached quick-slide connectors, the the new antenna and vehicle wiring must have quick-slide connectors; if the antenna/vehicle wiring is not fitted with slide connectors, connectors may be purchased and crimped onto the power antenna wiring. Searches related to the Metra 44-PWEC157 Power Antenna Kit Includes 157" of signal, power, and turn-on cables to install a power antenna in your vehicle.